Beginning to run can be as simple as plopping on a pair of running shoes and running out the door. But to ensure a healthy and injury-free start as well as some stick-to-it-ness for a lifelong activity, here are 10 "To-Do's" to help you on your way. 2. Buy several pairs of synthetic socks! Toss those cotton socks back in the dresser. When you run, you sweat and all that sweat runs down your body and into your shoes. Cotton socks will act like sponges and soak up all that moisture. That's a blister just waiting to happen. And believe me it will. I began running in the 80's when cotton was just about all we had. Even if you don't sweat profusely, cotton still tends to be abrasive and can cause blisters. There are a wide variety of socks make of synthetic technical fibers designed to wick the moisture away and allow it to evaporate. Stretchy, close fitting socks work well for most runners. Not only will they cause less friction, they can also provide some arch support. 3. Buy running shorts and tops made of technical fabric. Same story as the socks. Unless you live in a very arid climate, 100% cotton shirts and shorts will soak up the sweat, weigh you down, and can cause nasty chafing. 4. Buy a pair of shades, a running cap, and some sunscreen. This one is pretty strait forward. There has been recent research showing that runners tend to have a higher chance of getting skin cancer. Shouldn't be that surprising. Unless you run inside, you're going to be out in the sun. A lot. If it's hot, you're probably going to wear short sleeve shirts and shorts. So, do what you can to protect your skin and eyes. 5. Surround yourself with other runners. 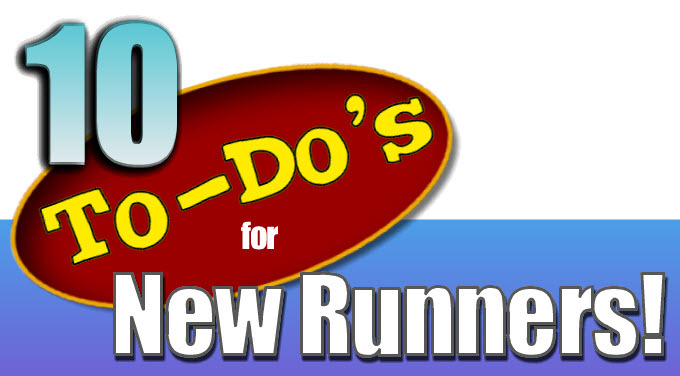 Most new runners are the "lone runner" in the family. Chances are, the other members of your family think you're nuts. If that's the case, you'll need support when you start running. It's a life change. You need encouraging words as your body acclimates to the new demands you're putting on it. Join a running club. Find area group runs, find a beginning running group. If you don't have a local running store in your community, head to the local coffee or bagel shop early on a Saturday morning. Chances are you'll see some runners either heading out for a run or coming back from a run. Runners are great people. Don't be shy. Ask them if they're runners and if they can tell you about the local running groups especially ones geared for beginners. Also ask about running routes, greenways and trails in the area. Chances are you'll be invited to join them on their next group run! 6. Fuel your new activity. Running will put a lot of new demands on your body. Good demands. You'll be ramping up your metabolism and increasing your aerobic fitness. Be sure you fuel this new activity with good nutrition. On average you need about 100 calories for each mile you run. So if you plan to run 4 miles you need 400 calories to support that run. This actually varies depending on how much you weigh. If you weight 120lbs you’ll need about 95cals per mile. It goes up about 15cals for every additional 20lbs of weight. So, a 180-pound individual will need about 140cals per mile. Complex carbs from whole grain foods make great pre-run fuel sources. A whole grain English Muffin with a little peanut butter about an hour before your run makes a perfect pre-run snack. Don't forget to refuel after your run too! It's important to replace the carbs used during your run as well as ingest a little protein to help your tired muscles rebuild and repair. A 2:1 ratio of carbs to protein 30-40 minutes after finishing your run makes a great post run snack. Because you want to quickly replace the lost carbs, the post run snack can be comprised of simple carbs such as from a sports drink or (believe it or not) lowfat chocolate milk. Lowfat chocolate milk actually has the 2:1 ratio of carbs to protein! Who da thunk?! 7. Hydrate! Be sure to hydrate before and after your run. As a rule of thumb drinking 16oz of water 2hrs before your run will ensure good hydration levels and give the water time to pass through your system so you don't have to make any pit stops during your run. Hydration during your run depends on the temperature and the length of your run. If you're running 4 miles or less, you probably won't need to carry any water with you. If you're running longer than 4 miles you may need to carry water in a hydration belt of stash it along your route, especially if it's hot and humid. After your run, you need to replace the water you've lost. A good way to check this is to weigh before your run and then weigh after your run. Drink 16oz of water for every pound of water lost. After you do the weigh-in a few times you'll get a feel for how much rehydration you need depending on how much you sweated and you probably won't need to actually weigh yourself. 8. Be safe. Secure your house/car key by tying it to your shoe, or putting it in a zippered pocket. If you're running on isolated trails, take your cell phone. Be sure to let a friend or family member know your running route for the day and when you should return. Carry ID! You can purchase a shoe wallet that you can lace onto your shoe and then slip in your driver's license or better yet buy a RoadID necklace, shoe tag, anklet, or bracelet. If at all possible try not to run alone in the dark early hours of the day or at night. If you do run at night or in the early morning, be sure to wear a reflective safety vest or reflective clothing (something more than the tiny reflective patch on the back of your running shoes). 9. Record your progress. Keep a journal of your running progress. Each day record your mileage, how your run felt, and any other data that might be important such as the weather or if it was a stressful day. There are a variety of free online running logs such as dailymile.com and runningahead.com that are wonderful tools for recording and tracking your data. If you keep a record of your progress, you can actually look back over your data and evaluate your progress. Hopefully you won't, but if you happen to have a running related injury or suffer from overtraining, looking back over your running log data can help you pin point periods in your training that may have caused the problem. 10. Have Fun! Enjoy your new fitness commitment! Now if you'll excuse me, I must finish my chocolate milk and enter some mileage on runningahead.com in my wicking shirt. Thanks Lauren and Jill! Yep, I need to be reminded of the post run refueling. Hi Josh! Rantings good. Don't forget the hat and sunscreen too! Great post! In my opinion, the most important item on the list is the last item. Have Fun!!! We all have different reasons for running, but why do it if you don't enjoy it. I have done all the things in your list! Nice! Great advise, i am a new runner, started running like 3 month ago. i started running because a plan on becoming a police officer and need to be in good shape. i am going shorter distances 2-3 mile, and going for speed more than distance. any tips? good advise. i am new to running, i started about 3 months ago. i started because i am trying to become a police officer, i have been running 2-3 miles, going for speed over distance. any tips? Beware of the Ambition Trap! WHAM! POW! BANG! Life Sure Can Pack a Punch! Looking for That Runner's High?